Intelligent pets take finesse. You're in it for the long haul. 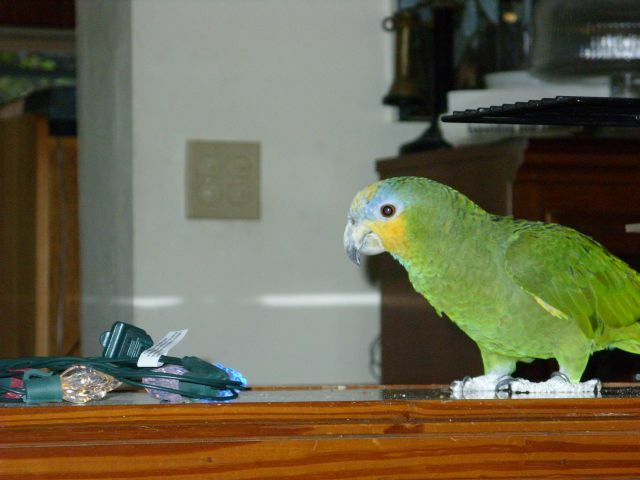 I've had my Orange Wing Amazon Parrot, Oscar since 1986. His personality evolves continuously. Now that he's decided to be a part of the flock instead of keeping himself apart, he's insisting on being heard. That's why his cage is on the floor at this moment. Yelling at a Parrot doesn't work. He'll learn to yell back. Any parrot will yell louder than you will so it's not going to help. There's a cockatoo that lives three blocks away and when the wind's right I can hear him at least a block from his home. I've set the cage on the floor a mere 3 feet from my knee at the moment, after telling him I was going to put him outside so "he can play with the hawks". Better to keep him inside where the local wildlife won't inspect the mango sitting on the bottom of the cage. He is why I have found an excellent pair of $3 noise cancelling headphones to listen to music while I am trying to get things done. We learned where the parrot zone of noise is and keep the sound in the house to a minimum. Since the dog is getting profoundly hard of hearing, she's not adding to the drama preferring to sleep the day away. When you have a curious feathered Einstein living with you, they demand their own attention. My neighbor from across the street has learned to talk to the parrot quietly and make sure you remove the baseball cap. He does this because from the moment he comes in, Oscar is making his jungle noises to get his attention. Say hi to the bird and let him get it out of his system. Like having a toddler isn't it? Why is the sky blue has a special quirky poignancy to it because you can understand it. Brakk, squawk, squeek, whistle does not have the same weight. So now that he's on the floor I've just opened the door to the cage so he can walk around. Being a social creature he's trying to make friends with Lettie, my dog. She's not fond of that. In fact the latest trick that the parrot has taught the dog was the Go Into The Bedroom trick. I open the cage door, and Oscar comes out. Walking down to the floor he looks for the scraps that the dog left from that dog biscuit that I gave her about an hour ago. Not understanding the theory behind Letting Sleeping Dogs Lie, Oscar stealthily approaches. By Stealthily, I mean, saying Hello and "Urp" and other jungle noises. I guess that's Orange Wing Amazon for "Hey let's play". Lettie is still asleep since she can't hear this. Oscar walks over to Lettie and tries to preen her. Now, I know that it's meant as a gesture of friendship. I've stood next to his cage and he'll walk over and preen my hair, even going so far as to gently grasp my earlobe. But to a 12 year old, mostly deaf, Mc Nab Dog who is fearful of other's shadows as well as the shadow's owners, this is a call to action. Lettie understands that one is not to eat the parrot. He's a tough old bird and wouldn't taste well anyway. She takes the high road. Standing up, she barks at the errant reprobate of a bird four times, then trots out of the room. It's always four times, maybe that means something in Dog, I don't know. Being curious, Oscar has done his deed after moving the dog so that he can pick up the dog mat and check it's texture, then move onto the sea grass basket and try to see if he can get in a few chews before I tell him to go home. No, Oscar, the dog's mat hasn't changed and I still don't want you chewing on the furniture. Now, you've had your fun and "Go Home!". Having said all that I watch as the mostly green bird waddles his way back into the cage. I lock him up and take the time for a nice block of piece and quiet.